If your infant or young toddler does not have a cadre of friends, don’t despair. As different stages of play evolve, so will your child’s social skills. Infants will often engage in solitary play, in which they entertain themselves with a toy without observing what the other children around them are doing. Onlooker play and parallel play may begin after a child turns 2. 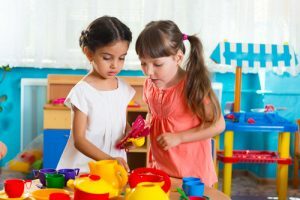 Onlooker play involves a child watching what others around her are doing, and parallel play happens when a child begins to mimic that behavior. When a child is between the ages of 3 and 4, he may begin to engage in associative play. Associative play is play in which children interact with one another, but in an unstructured manner. Soon after, between the ages of 4 and 5, children will begin cooperative play. This type of play may involve rules, roles, and may be organized by the children themselves. As your child begins to notice the kids around her and interact with them, teach her the important social skills she’ll need for interactive play. Sharing is a big part of learning to play. Children must be taught not to grab other kids’ toys, and may even learn to notice when a child has no toys to play with, and offer that child a toy. This type of helping behavior is also an essential part of building friendships. Cooperation is key. Your child will also undoubtedly experience some anger and frustration as she encounters different types of play with other kids. Help her to control her frustration and communicate it in a productive and calm manner. Remember that you are your child’s role model. Exhibit polite and kind social behaviors at home, and your little one will mimic your actions. Be courteous to your children, resolve difficulties with partners and other family members in a calm and polite manner, and your child will pick up on your harmonious ways of interacting, and put those skills in her toolkit for play at daycare or preschool. Don’t be alarmed if your child seems to build types of friendships that seem a bit different to you. Some children will become very attached to one other child, and an intense friendship will form. Others will simply exist in an orbit of various children, playing, but not developing close friendships. Children have different preferences in their social interactions, just as adults do, and this is all normal. Be sure to consult with your childcare provider if your child is having difficulty socializing. Many factors, such as ADHD, learning disabilities, and other behavioral issues, may cause your child to behave differently from other children. Other kids may observe these differences, and may not be sure how to enter into a friendship with your child. You can help your child to become better at communicating, having patience, and controlling their behavior. 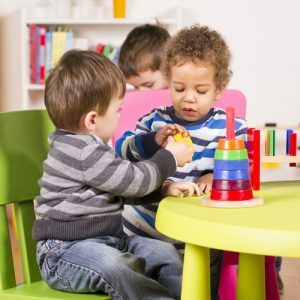 In turn, your daycare provider can help other children learn to accept different types of behavior, and to be respectful and kind rather than bullying. These strategies will help a child fit in, despite some differences and difficulties he may experience. Some children simply develop healthy friendships naturally. But in many cases, modeling good behavior, teaching social skills, talking to kids about acceptance and kindness, and setting realistic expectations for children’s socialization, will make this stage of development easier on both you and your child.